Classy audio for classy people. Hertz is a simple audio recorder that doesn't compress your sounds into oblivion. Most "sound recorder" applications on the marketplace—and even the built-in Android Sound Recorder—save your audio into the 3GPP format. This makes anything other than simple voice recordings sound like they've been put through a meat grinder. Hertz records your audio straight to the uncompressed WAV format, at a sampling rate of your choosing. No processing or compression. 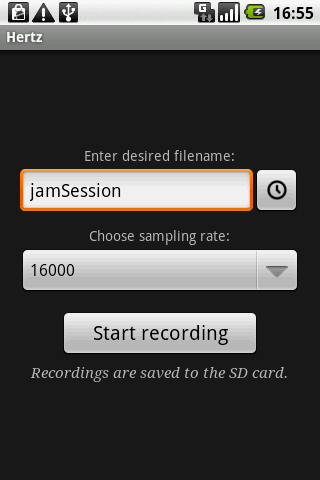 Just higher sample rates for higher-quality recordings. You can then grab it off the Android's SD card and do whatever you want to it. Hertz is now available in the Android market. Alternatively, you can download the package from here. Bear in mind you'll have to turn on installing from unknown sources in Settings > Applications.